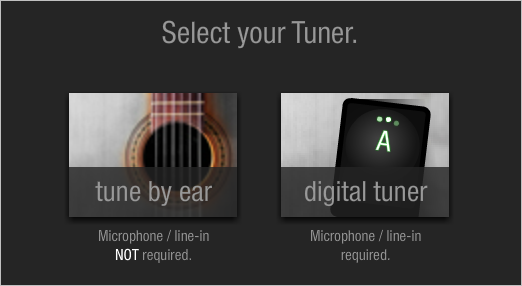 I've set this page up to provide a free online guitar tuner, alternate tunings and lessons on tuning up your guitar in several ways. Bookmark this page now so you have a guitar tuning resource to come back to again and again! Don't be complacent with tuning - it doesn't matter how amazing you are on guitar, if it's not quite tuned right, you'll ruin every bit of charisma you thought you had - Just. Like. That. Also, don't just rely on electronic tuners to do the work for you. Learning how to tune using harmonics, for example, is a good backup method. What I tend to do is use a few of these tuning techniques: one to tune up, another to tweak and fine tune. They can all work together to ensure your tuning is spot on. All-in-One Guitar Tuner From Standard to Drop B and Wahine tuning. Either tune by ear or plug in to tune digitally. Guitar Tuning Basics If you're a beginner, this lesson will take you through the absolute basics of tuning guitar. Tuning Down Half Step / Whole Step Learn how to tune down half and whole steps for a deeper sounding standard tuning. Includes both tuning pitch references and instructions on how to tune without any aids. Drop Tuning (Drop D, Drop C & Drop B) Drop tuning is most commonly used in heavy metal, but is great for any playing which requires a lower bottom string bass note than standard. Includes tuners for drop D, C and B.
Alternate Guitar Tuning Includes DADGAd, 6th and perfect fourth tuning for some fresh sounding chords. How to Tune Guitar Using the 5th Fret Method The most common method of relative tuning (tuning a guitar "to itself") without any aids except the strings on your guitar. How to Tune Guitar Using Harmonics A more accurate but challenging way of tuning than the 5th fret method. Learn how to create harmonics on your guitar and use them to tune up. How to Tune Guitar by Ear An interesting lesson that introduces you to the concept of relative pitch, learning to tune your guitar purely by ear based on the intervals between each string. Other Tuning Tips and Tricks Tweaking and fine tuning tips. Using a Guitar Capo Learn how different types of capo work and how they change your guitar's tuning. Capo's are used for raising the tuning pitch. The below all-in-one online guitar tuner allows you to either tune by ear or plug in your guitar and use the digital tuner through the line-in on your soundcard.